My team is comprised of experts in the worlds of fitness and body-building. They’ve competed. They’ve trained. They’re who you call to prepare for competition if winning is your goal. Each person has an inspiring story and brings their passion and experience to the Fitness Physiques competition. Read more about my team, then look at the incredible transformations they’ve made. Kass is the winner of the 2018 UK Men’s Physique for Ben Weider IFBB (International Federation of Bodybuilding and Fitness). He is a sport and personal trainer, an accountability coach, and a posing coach. His background and expertise also extend to dance, where he has created a style that is endorsed globally. His positive attitude, encouragement and detailed coaching techniques transform his clients—no matter if they are seasoned athletes or beginners. For bodybuilding and fitness competitions, Kass has a unique Ace360 posing style that ensures his clients look the best on stage so they can show off their hard-work for the judges and win. For the past four years, Ike has been competing, and winning. His first competition was Pure Elite 2015 where he placed third in men’s fitness and won best abs. The 2015 UKUP was even better. He won first place in fitness and physique and was also the overall winner. 2016 further proved his love of fitness was part of his identity as he took first place UKUP British finals for fitness and mens physique, and won the overall competition, earning him the prestigious Gold Pro status. In 2017, Ike’s goal was to become the Great Body of Africa. He competed at the Mister Africa international representing the great Country Madagascar. That same year, Ike won the Bodypower Model Search competition and took first place at his first pro show, receiving a cash price with UKUP/WUP at Bodypower. He also defended his tittle at the British final/pro show where he won first place in the pro men's fitness and first place pro men's physique. In 2018, Ike switched federations and went into PCA. His first competition with them was at Bodypower were he took first place in men's physique and was invited to compete in their Pro show the very next day where he took 5th place against the other pros and won a cash price. He finished the year by competition in the PCA British finals, taking 6th place for men’s physique and 5th place in World at PCA. It’s clear Ike has a track-record of success and understands what it takes to win. Ricky Coker is a strength and conditioning specialist. He has been a personal trainer for the past 6 years but his passion for health and fitness extends much longer. At aged 16 Ricky was a junior boxer. He began competing at 18, becoming a semi-professional boxer. It’s clear Ricky is passionate and determined based on his results: Southern area champion (2014), IBA International title (2015), English Champion (2015) AND International Champion (2018). In 2016, Ricky became a professional boxer and remains undefeated after six fights. Ricky believes there is nothing he can’t do and he brings that same energy, passion and experience when he works with private clients, teaching and coaching them to achieve their goals. He specialises in body confidence, fat reduction, muscle definition and sports training. Ricky also provides nutritional guidance for weight loss and muscle development because he understands from personal experience and research that it doesn’t matter how hard you train if you aren’t giving your body proper nutrition. Word has quickly spread about Ricky and his approach to fitness with 100s of clients and growing. Ricky’s next triumph is being sculpted and defined now, ready to take over the world of fitness. Our coaches know exactly what judges expect to see and how they will rate you. Special techniques and practice will help you prepare for the competition, so when you step on stage, you have the best chance to properly show off your hard-work and win. We strongly urge you to start as soon as possible. Run by IFBB Pro Karen Marillier (see the picture on the left), Show Tan were the first competition tanning service in the UK and have been providing winning tans to World Class and International physiques, professional bodybuilders, figure and fitness models for over 10 years. With a fully qualified team specialising in all areas of competition tanning, Team Show Tan (see picture on the right) are passionate about providing a professional and friendly tanning experience where every athlete is important and not just another body to tan. Setting them ahead of the game, Karen is a former IFBB Pro with over 13 years competition experience, competing nationally and internationally on the Pro Stage. Her spray tanning team have all competed with have plenty of stage experience. They not only know the importance of a good tan, but how you feel on the day and how hard you’ve worked to get there. Karen says “We know how important the show is and we want you to feel comfortable and assured that you will look perfect when you step onstage. Our service isn’t just about a great tan, from the moment you book your tan; you are #Showtanstars’ and we will go that extra mile to give you a great experience as well as a #winning tan. 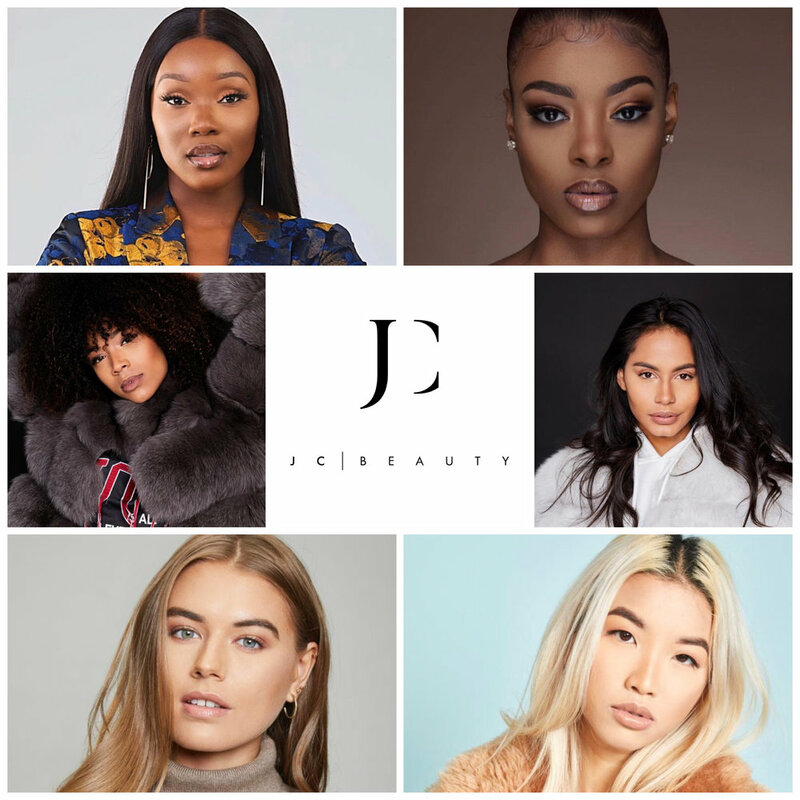 JC Beauty has been working in the makeup industry for the past four years, travelling throughout the world for tv and film, commercial shoots, bridal and corporate clients. JC Beauty has now built a team of like-minded ladies who are dedicated to making women and men look and feel amazing for their special day or event. They know how to make athletes look their best on stage. Book hair and make-up today. Katarina founded Bikini BKB (Bikini Katarina Biros) in the summer of 2016 after struggling to find the right bikini for herself. She had ordered six bikinis online—of which only a few were ok, but the quality didn’t match the cost. After 15 years competing as a dancer and extensive experience sewing dance and theme costumes, she decided to make her own bikinis for her next competition. Her decision paid off as she combined her creative energy with her love of sewing and her knowledge of what it takes to look good on stage. She loves creating original, beautiful custom bikinis. Each bikini is bespoke, helping her clients show their unique personalities and look the best they can. She is based in central London. Katarina remains an active bikini and fitness model competitor in IFBB/UKFF - living the healthy fitness lifestyle every day. She knows what's it like to be on stage and how important the cut, style,color and overall bikinis are for you. For the past two years, Lisa has been active in the fitness competition industry and has competed in three competitions, including BodyPower UK. During this time, Lisa has gained invaluable experience and knowledge, giving her a better understanding of techniques to help other people reach their peak performance for competition. Lisa entered the world of fitness after battling serious health issues. She was diagnosed with Crohn’s disease nine years ago. After her third operation, she decided to control her flare-ups with diet and exercise. She became a personal trainer and completed her IOC diploma in sports nutrition—both of which benefit the health and fitness of her and her clients. Look at Lisa’s incredible transformation. She’s proof of what you can achieve with exercise and pure determination. Lisa is a proud mother of two and knows that with the right coaching, help and support, the impossible is possible. Joanna has over 25 years of experience as a trained dancer, model and presenter, working both on stage and television. Joanna enjoys helping competitors maximise their potential and bring out their very best in their physique and stage presence. She uses her experience as a dancer to choreograph posing routines and t-walks for both men and women. Her favourite category to work with is transformation because she has been through a journey to lose more than 6 stone. Joanna has also worked for Cage Rage, a UK MMA company and managed the ring girls and dancers/models. She would choreograph the Live Fight Night Openings for Sky Sports TV using approximately 20 dancers. Joanna enjoys judging fitness model and physique shows and is also a qualified WABBA bodybuilding judge. Judging competitors fairly and concisely is something she is passionate about. Conor Wells is the owner of The Toibreacha Academy of Irish Dance. Conor first got into Irish Dancing because of his mothers Irish background at the age of 7. Conor continued to dance until the age of 13 and then stopped to focus on his exams and School Work. Conor returned to dancing at the age of 18, and this is when he excelled. In the course of 3 years Conor placed 2nd in The British Open Championships (twice) and took home the Irish Open Champion title two years in a row. However, Conor’s biggest achievement came in April 2018 when he competed in The WIDA World Championships in Maastricht and became the Under 21 World Champion. Conor retired from competing and in May 2018 opened his own academy in Potters Bar, Hertfordshire. Conor now has over 30 students and is always looking to expand and create his team of champions.